-Our chicken dust is one ingredient, chicken breast! We hand slice and slow cook human grade chicken to perfection. -We don't believe in fillers or preservatives. -If you agree that our beloved furry family members should have top grade food at a cheaper cost than all those others with all that junk added then this is for you! -Not only are you purchasing a high quality treat for your dog but you are also donating to animal shelters... we give 10% of all profits right back to the animal community. -This product is intended to use within 30 days of opening if kept in original pouch at room temperature; prolonged shelf life if kept in the freezer. One ingredient, all natural human grade chicken breast! No fillers, dyes, additives, water or preservatives are used in our jerky. We hand slice our chicken breast and slow cook in small batches directly for your pup! USA sourced, processed, and packed! Our chicken is handmade in the heart of the USA, Ohio. We source from local farms for the highest quality chicken. Nutritious and delicious! Since we only use chicken breast this food topper is low fat and high in protein. This makes a perfect treat for those pups that are a little overweight since this natural chicken is low in Carbohydrates. Low cost! We have found many food toppers out there to be way overpriced. We want every household and pup to have the best at a reasonable cost. 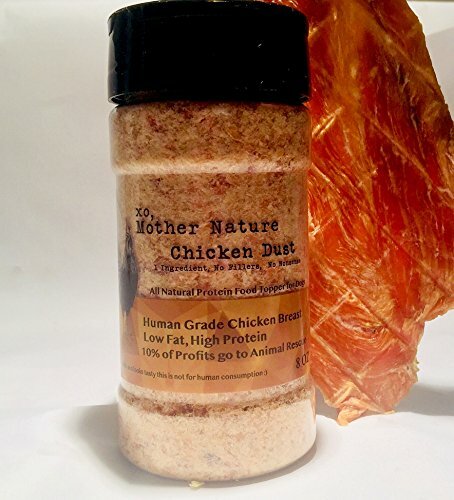 Not only is our chicken dust priced right but 10% of all profits are donated to animal programs and shelters. Manufacturer: Doggy Bag Monthly Ltd. Publisher: Doggy Bag Monthly Ltd. Studio: Doggy Bag Monthly Ltd. If you have any questions about this product by XO, Mother Nature, contact us by completing and submitting the form below. If you are looking for a specif part number, please include it with your message.